It is said that an actor becomes a star once the man (or woman) on the streets begins to imitate his/her mannerisms. Mannerisms do create stars, but to the chagrin of the actor, they end up slotting them as well. One of the first people in Hindi cinema to try breaking a pre-existing pattern when it came to film acting, Dharmendra’s stardom transcended labels. And while the pundits or the trade never crowned him as the king of Hindi cinema, he was among the greatest onscreen icons for audiences across three decades. While he went on to be viewed largely as an action star, even lovingly called Garam Dharam for the better part of his almost 60-year career, there is hardly any genre that he didn’t leave his impression upon, and perhaps this is the reason why he has often been referred to as a ‘complete’ actor. Dharmendra had shifted to (then) Bombay in the mid-1950s and it was in 1958 when he was spotted by none other than Bimal Roy in a Filmfare Talent Contest at Mehboob Studios. 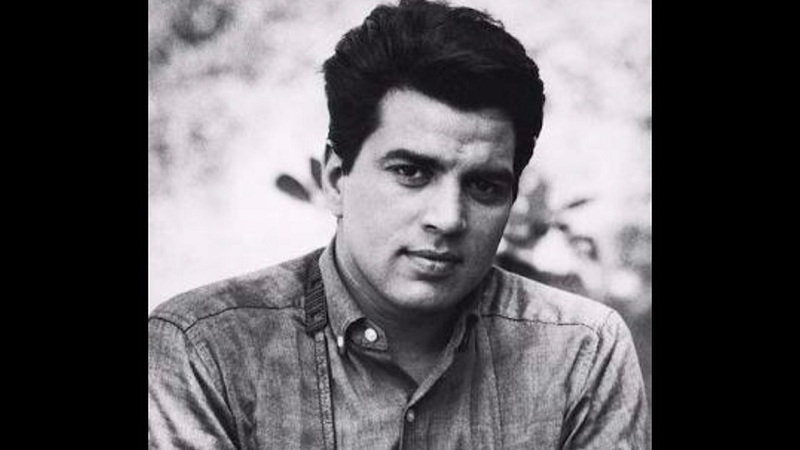 Following his ‘discovery’ Dharmendra debuted in Arjun Hingorani’s Dil Bhi Tera, Hum Bhi Tere (1960) and after Bimal Roy’s Bandini (1963) he came to be seen as an actor to watch out for. He was also perhaps the first non-action star of the era such as Dara Singh or Jairaj before him, who appeared bare-chested in a film, that laid the foundation of his superstardom. Dharmendra’s character, Shakti Singh or Shakka in OP Ralhan’s Phool Aur Patthar (1963) was a departure from the tough-guy roles of the period that were often portrayed most notably by Dara Singh in films like King Kong (1962), Rustom-E-Baghdad (1963) or Faulaad (1963). Here, Shakka was the toughie with a soft heart, who while burgling a house in a plague-infested area comes across an abandoned widow, Shanti (Meena Kumari), and nurses her back to health. In some way, Shakka, the rugged rogue, was a variation of the genteel Deven, the jail doctor that the actor portrayed in Bimal Roy’s Bandini. Blessed with Adonis-like looks, Dharmendra could play both a brute or the decorous everyman with equal conviction and it wouldn’t be incorrect to say that it was he, who was the first to break stereotypes associated with either extreme in Hindi cinema. The period between the mid-1960s and the mid-1970s was a strange one for India. This was a time when the nation bounced back from a humiliating defeat at the hands of the Chinese in 1963 to crush Pakistan in 1965, went on to liberate a nation (Bangladesh, in 1971), only to be pushed into a dark era of national Emergency imposed by Indira Gandhi in 1975. This was also a period where the process of the gentrification of the Hindi cinema audience had come full circle. Although stars such as Rajesh Khanna, Amitabh Bachchan, Hema Malini and Vinod Khanna best encapsulated the mood of the nation in terms of popular Hindi films, it was in fact, Dharmendra who epitomised the common man. Of course, the Angry Young Man as embodied by Amitabh Bachchan via Zanjeer (1973) and Deewar (1975) or the phenomenon Rajesh Khanna are better recalled; both, nonetheless, owe a great debt to the characters portrayed by Dharmendra between 1966, the year when Phool Aur Phattar released and 1975 when he had a golden year with Pratigyaa, Sholay, and Chupke Chukpe. The women-centric films where Dharmendra made his mark – Bandini, Anupama (1966), Phool Aur Patthar – are almost the precursor to some of the biggest hits that Rajesh Khanna experienced right from Aradhana (1969), Khamoshi (1969), Kati Patang (1970), Amar Prem (1972), Daag: A Poem of Love (1973) and Aap Ki Kasam (1974). Similarly, Dharmendra’s finest hour as an actor in Hrishikesh Mukherjee’s Satyakam (1969) has for long been considered an inspiration for the Angry Young Man. The upright Satyapriya ‘Sath’ (Dharmendra) is one of the first characters in popular Hindi cinema to showcase the disillusionment with post-independence expectations and highlight the evils of society such as unemployment, continual poverty or rampant corruption, which inspired Salim Khan and Javed Akhtar to embellish their creation, the Angry Young Man, with as well. It’s interesting that Dharmendra’s Shakka in Phool Aur Patthar was one of the first ‘heroes’ to not sing lip-sync any song in a film and this trait was attached to Amitabh Bachchan’s Angry Young Man in Zanjeer and Deewar. Besides the socials and the action films, Dharmendra was also among the all-time greats with an impeccable comic timing. Although his initial films never fully explored this facet, the 1970s saw him go all out with Pratigyaa and Chupke Chupke, which is counted among the best Hindi comedies. Besides Dev Anand and Shammi Kapoor, most of the leading men rarely indulged in comedy and despite the presence of a Kishore Kumar or a Mehmood, two stars who were primarily seen as comedians, there weren’t any leading men comedies in the 1970s until Dharam ji changed that. A Dilip Kumar tried lightening things with a Kohinoor (1960) and later Ram Aur Shyam (1967) but once Rajesh Khanna emerged as the box office king, the genre had lost favour with A-list stars. Both Pratigyaa and Chupke Chupke changed the perception and later, with Amitabh Bachchan featuring in Hera Pheri (1976) and Amar Akbar Anthony (1977), the genre was more acceptable for heroes. Dharmendra also featured in Basu Chatterjee’s Dillagi (1978), a comedy that didn’t fare well but offered him a better-etched role with lesser one-liners than Chupke Chupke. It’s a treat to watch Dharam ji in Dillagi where he plays a Swarnakamal, Sanskrit professor obsessed with Phoolrenu (Hema Malini), the chemistry professor, for he feels that she is his Shakuntala. Intriguingly more than his action or social roles, the manner in which Swarnakamal refuses to give up his dreams and carries on without a care for the light at the end of the tunnel reveals the hero that Dharmendra often played. As Dharam ji turns 82 he continues to be the beloved hero of millions across the world not because he always won or beat the bad guy, but because he put his heart and soul into everything he did, both in life and in films no matter what — because that is what heroes do.